#JewishStPetersburg. #Jewish. #RussianJewish. #SaintPetersburg. #StPetersburg. #BigChoralSynagogue. #ESOD. St Petersburg Russia jewish tours. Jewish Community Centre. History and culture of the Jewish people. Monument to the victims of the Holocaust. Petersburg Synagogue. Jewish Cemetery. Shore excursions St. Petersburg Russia. The life of the Jewish community in St. Petersburg was (and still is) complicated and full of challenges. The Jewish people have always been part of the history of this city since the time of Peter the Great. Nevertheless they could not avoid the repressions and persecutions that all the Jews in Russia suffered at the times of the Tsars and during the Soviet period. The repressions would impact both – religious and social life of the Jewish population. The Jewish people were not allowed to live in the Capital city for a long time – most of them had to move to the South of Russia to live behind the Pale of Settlement. Even after it became possible to settle in this city – they could not build a Synagogue until the second half of the 19th century. No need to remind you of the Stalin Repressions of the 1930th and the Holocaust victims of the World War II... 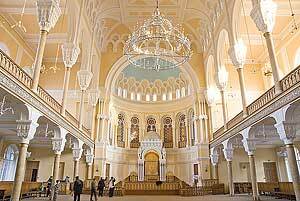 Despite all the difficulties currently St. Petersburg has one of the most beautiful Synagogues in Europe and a developed Jewish community which is active in all the fields of religious and social life. NB! These packages could also be adapted for those who stop at our hotels. In this case the cost will be recalculated. NB! For Cruise line passengers: if you do not have a possibility to order the Jewish Heritage tour privately you may join our mini-group tours. At your request we will have a stop at the Petersburg Synagogue (possibility of a short visit) and at the Monument to the victims of the Holocaust. The Big Choral Synagogue. Since it was completed by 1893, the Synagogue has always been active, even (by some miracle) under the Soviets. It is the second largest Synagogue in Europe. It is also a most beautiful building constructed in the Moorish style. Though the Synagogue is a very important architectural and historical monument it was hardly taken any care of after the World War II, so the building was in a deplorable state until Edmond Safra, the famous South Afrcan banker, donated a huge sum of money for its restoration. It’s possible just to visit the Petersburg Synagogue or to organize a special tour. You also can visit a Kosher food store and a Kosher restaurant which are on the territory of the Synagogue. More detailed information about Synagogue you can find here. ESOD (the Jewish Community Centre) - the building that was opened in 2005 currently houses 6 Jewish organizations - Hesed Avraam Charity centre, Adain Lo family centre, Hillel student centre, Granatik children centre, ORT educational centre, Library&Eitan Jewish Education centre. ESOD is one of the main centres of the Jewish Community life in St.Petersbutg today. You can find more information on the official cite of the Center. "History and culture of the Jewish people on the territory of Russia" – an exhibition in The Russian Museum of Ethnography. The idea of this exhibition was announced by the President of the Russian Federation Vladimir Putin during the meeting with the Prime Minister of Israel Ariel Sharon in 2003. The exhibition is considered to be the first step towards opening a separate museum of Jewish culture. The tour of the exhibition will take from 45 min to 1 hour and will be conducted by a specialist of the Museum. You can find more information about the exhibition here. Monument to the victims of the Holocaust (The Formula of Mourning) in Tsarskoye Selo – a monument that is situated 500 meters from Catherine’s palace in the place where during the World War II there was a ghetto. Jewish Cemetery (Pr.Alexandrovskoy Fermi) – a cemetery which exists since 1875. From the architectural point of view the most interesting monument there is the Lavabo House. The Jewish Cemetery is a burial place for many historical figures such as Mark Antokolsky (a famous sculptor), David Ginsburg (a scientist and art lover, the leader of the Jewish Community in the 19th century), Abraham Lubanov (the head Rabbi of the St.Petersburg Synagogue during the time of the World War II and the post-war period), Moses Altman (a famous writer). 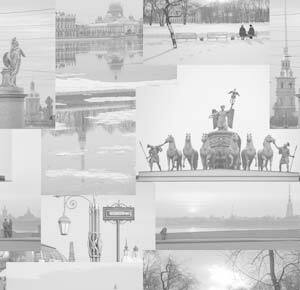 You can find more information about the Jewish Community of St. Petersburg here.